The universe is bright but are they in the Dark? The light observed coming from the ionized hydrogen atoms in the IGM is five times more than there should be. Simulations of the early big bang universe agree with the amount of light generated by sources observed at those epochs, but they widely disagree with the universe we observe much closer to home, in the low-redshift universe, meaning much more recent in its alleged history. 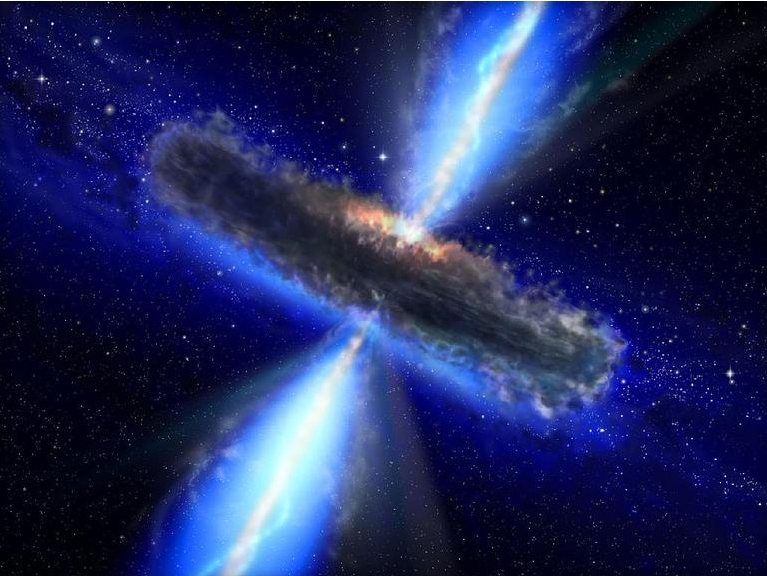 Figure: An artist’s impression of a quasar. There’s just not enough of them to account for interstellar light, say researchers. Credit: NASA/ESA See Ref. 1. Cosmologists have this problem because they assume that along with active star-forming galaxies, quasars—extremely active galaxy-sized objects, which emit a lot of radiation and often have large redshifts—are the main sources to have photo-ionized the IGM. This is because they assume that having large redshifts means that they are predominantly the occupants of the early universe, from which all normal galaxies that we see at low redshifts ultimately are supposed to have evolved. It is this initial big bang model assumption which brings them unstuck. The logic goes like this: Quasars, and to a much lesser extent star-forming galaxies, emitted most of the radiation into the intergalactic medium in the early universe, particularly the UV light used as an indicator of the sources, which ionize the neutral hydrogen. The ionized hydrogen emits radiation at characteristic wavelengths—especially at the Hα wavelength of 656.281 nm, which is visible red light. So this is the easiest way for astronomers to detect the ionized hydrogen content of gas clouds in the IGM. Only if they are dissociated into single hydrogen atoms can astronomers detect the characteristic 21cm line at microwave frequencies. But if they are ionized they emit at the characteristic optical wavelengths that atomic physics tells us they should. Depending on the redshift of the hydrogen absorbers, this line is shifted accordingly. Nevertheless it is well understood (so it is believed) and easily identified. So one study carried out a survey of the low-redshift (i.e. nearby) universe. They added up all the visible hydrogen emission in the intergalactic medium, then compared that with simulations, based on what would be expected in a big bang ΛCDM universe,3 making the usual assumptions on Dark Matter and Dark Energy content etc. See also Claimed dark matter ‘find’ won’t help end ‘big bang’ crisis. That is self-evident. But would any of them consider that maybe they have started with the wrong foundation? Instead, leading astrophysicists speculate that the missing photons that ionize the IGM could be coming from an “exotic new source”.1 They would rather invent some new physics or invoke invisible decaying Dark Matter to solve their dark source problem. I suggest it is they who are totally left in the dark. We observe a local (low-redshift) universe that is five times brighter than it should be according to conventional big bang ΛCDM model wisdom. Yes, it is a research problem. I have nothing against that, but it is now a new irony that what is missing is not something tangible but the ‘darkness’ itself, because the universe in between the galaxies is too bright. That is, it should be darker; so where is that ‘darkness’? Instead of considering dumping the problematic model, and going back to the drawing board, or consulting the revelation of the One Who knows, they propose decaying Dark Matter to be the missing source that causes the intergalactic medium to be so illuminated. The tapestry was flawed long ago—it only grows worse with time. The universe is bright but the world is all in the ‘Dark’. Sarah Knapton, Where has all the light in the universe gone?, telegraph.co.uk/news, July 9, 2014. For this reason the cosmologists speak of the Dark Ages in alleged cosmic history. See Hartnett, J.G., Inflation—all in the ‘Dark’. Λ represents the cosmological constant, nowadays meaning Dark Energy, and CDM represents Cold Dark Matter. Both of these are necessary fudge factors needed in the standard model. Franco, M., Universe’s missing photon sources baffle scientists, cnet.com/au/news. Thanks for highlighting yet another “crisis” in the theory that the public is told matches all observations. I suppose that if there had been too little light in the IGM, then they’d claim to have discovered another property of dark matter….as it decays it absorbs radiation.